Two hours South of London, lying just off the centre of southern England, the Isle of Wight is known as the Garden Isle. It is a diamond shape, thirteen miles north to south and twenty three miles east to west. Within its boundaries, the Isle of Wight contains a wide variety of landscapes from sheltered river valleys to wild, wind swept headlands, from long golden sandy beaches to forests, picturesque villages and market towns. It is truly England in miniature. The Isle of Wight is blessed with a very favourable climate, being consistently warmer and sunnier than the English mainland, with sub-tropical plants growing in sheltered south facing gardens. The main industries of the Isle of Wight are agriculture and tourism with the resident population of 125,000 more than doubled during the busy summer holiday season from May to September. The fertile central Arreton Valley produces many fine early crops including tomatoes and garlic which is exported to France. 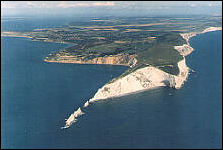 At the western end of the Island are the spectacular Needles, chalk rocks that are the homecoming point of vessels from overseas. 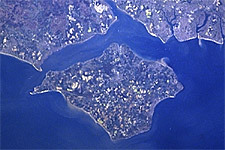 The Island is connected to the south coast of England by passenger and vehicle ferries to the ports of Lymington, Southampton and Portsmouth. See our Travel Information page for details.